Click the Global navigation menu at the top-right of the screen. Click the calendar icon to access the calendar. Click the My Institution Tab at the top-left of the screen. Click Calendar from the Tools menu. While inside your course container. While inside Tools, click Calendar. Click the Calendar link in the Course menu. 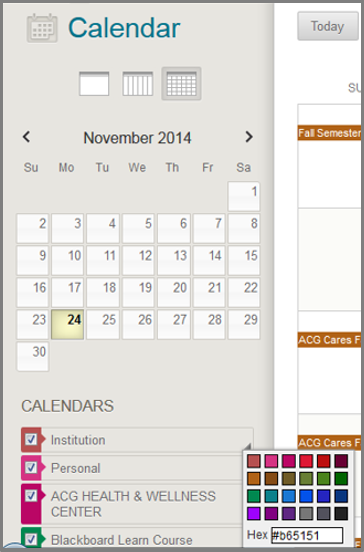 To create a New Event click the + button on the top right part of the page. Fill in the New Event Name field, along with the start and ending dates of the event. 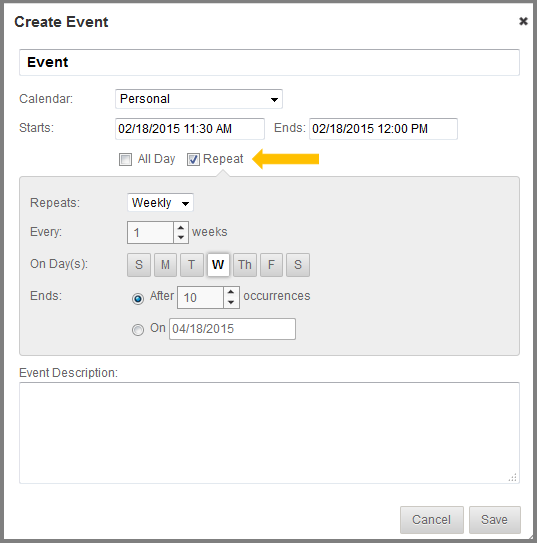 Recurrent events can be created by clicking the Repeat check-box and by specifying the respective repeat options. Finish by adding an Event Description about your event. To differentiate various course events (personal or Institutional) use colors. You are able to export the calendar items via the iCal feed to Outlook, Google or other third party calendars and view them from there. With the iCal you can choose what entries in your calendar you want to see and moreover add a new event.Get the iCal address by clicking the Get External Calendar Link button.